Whole grains offer nutritional benefits such as vitamins and minerals, but a good breakfast cereal also provides you with fiber. All grains are not created equal, however, so you need to be a smart shopper to find the cereals with the most fiber. In some cases, you might want ready-to-eat cereals; in others, you might prefer the old-fashioned hot cereals you cook yourself. The first item on a food label is the main ingredient. Most whole grains provide more fiber than refined grains, so look for terms such as "whole oats," or "whole-grain." Food labels typically include dietary fiber, which is another way to determine which cereal is highest in fiber. According to the Academy of Nutrition and Dietetics, women should consume 25 grams of fiber a day; after age 50, the recommended amount is 21 grams a day. 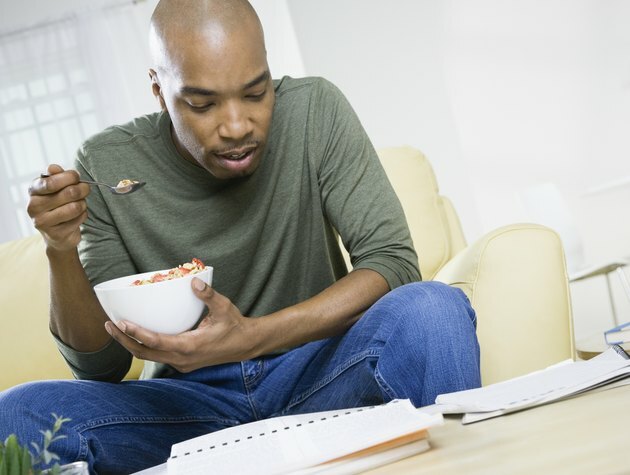 Men need 38 grams of fiber until age 50, then 30 grams thereafter. If bran is the first or second ingredient, that also indicates a cereal with more fiber, according to a July 2008 article in "Today's Dietitian." Some grains are higher in fiber than others, however. Corn bran has almost twice as much fiber per 1-ounce serving as oat or wheat bran. Cooked whole grains used as breakfast cereals also offer fiber. Cooked brown rice has 4 grams of fiber per cup, buckwheat groats have 5 grams, and bulgur wheat contains 8 grams.